GEDCOM is a widely used format for storing and transferring genealogy information. One easy way to transfer information from other genealogy software to My Family Tree is via a GEDCOM file. A GEDCOM file normally contains all the data in a single file with a *.ged extension. Select the file you want to import using File>Import GEDCOM. Fig 1. Importing a GEDCOM file. GEDCOM files often contain links to multimedia files stored in other locations. Files are automatically imported if they can be found on the local disk at the location the link points to. Any links to online files or files which cannot be located will be imported as place holders. You will be prompted to search for them after the import, or you can resolve them at any time in the Multimedia view. Where possible, the character encoding of the GEDCOM file is determined automatically during import. Warnings are issued if the encoding is uncertain or the file contains bytes which cannot be mapped to characters in the selected encoding. A custom character encoding may need to be selected in those cases, typically when importing GEDCOM files produced in older DOS based programs which used system wide code pages. Always export GEDCOM 5.5.1 with UTF-8 when transferring information from other genealogy applications. If you import a GEDCOM file and you discover that longer text is periodically missing spaces between words, you will need to reimport the file and check the "Correct text concatenation" option during import. This option will be checked automatically if the GEDCOM file in question is known to suffer text spacing issues. You should not otherwise enable this option unless you know your GEDCOM file suffers from text spacing issue. On rare occasions, you may encounter a multivolume GEDCOM file where the data is spanned across several GEDCOM files using sequential extensions (*.G00, *.G01 etc.). During import, place all the volumes in the same folder as the root *.ged file to ensure these are imported. The easiest way to transfer information from My Family Tree to other genealogy software is via the GEDCOM format. You can select which individuals to export and optionally include any linked multimedia files. Fig 2. Exporting a GEDCOM file. Fig 3. Selecting people to include. My Family Tree produces GEDCOM 5.5.1 files using Unicode (UTF-8) encoding with a byte order mark. 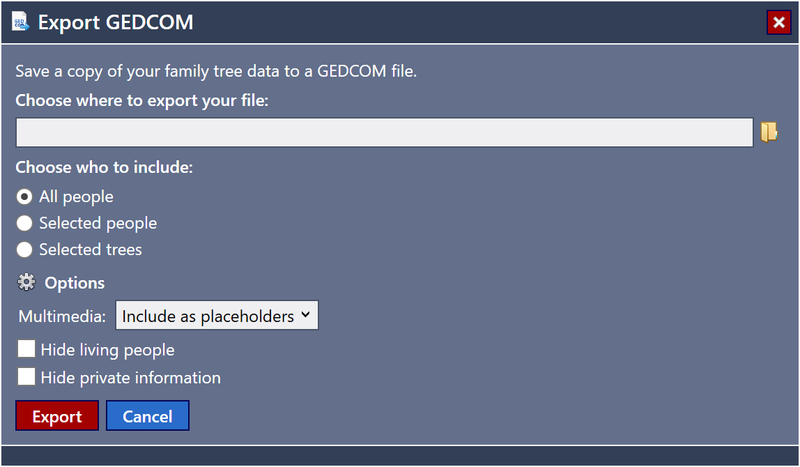 GEDCOM files can use extensions to store information which is not part of the standard GEDCOM form. 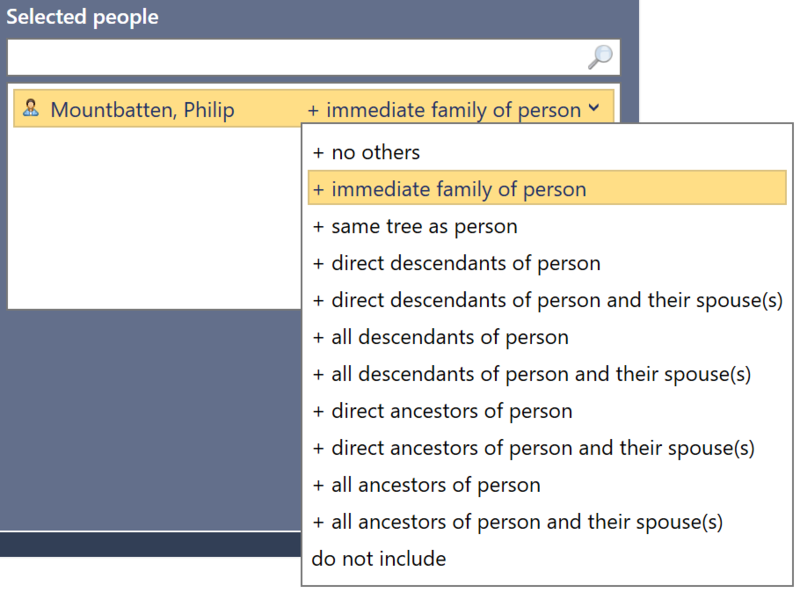 Details of the GEDCOM extensions used by the current version of My Family Tree can be downloaded from the knowledge base.